This past weekend, San Diego based The Baked Bear opened its doors at its first Arizona location in Scottsdale. 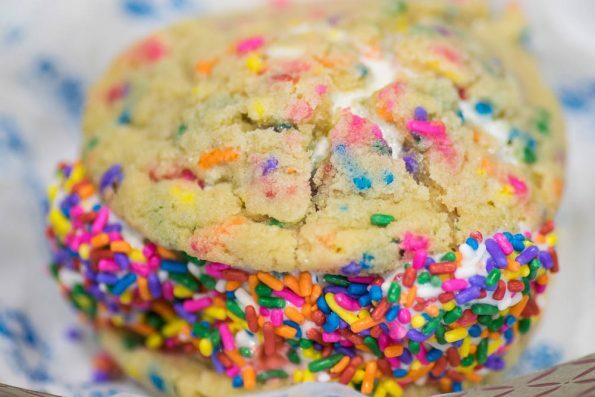 Looking to grow, co-owner Rob Clark (who has been in the baking industry for over 30 years) chose the valley because “People are hungry to have the homemade ice cream sandwiches they’ve come to love while on vacation, right here at home.” The Scottsdale location of The Baked Bear will be the 1st of at least 4 locations with the 2nd coming to Tempe. The build-your-own ice cream sandwich shop boasts 12 different ice creams, 12 different types of cookies, brownies (Ghirardelli Triple Chocolate, to be exact), and donuts. Customers have the option to create ice cream sandwich with any variation of tops and bottoms, as well as choose their ice cream flavors. All cookies are baked from scratch on site daily, in order to have the proper texture and shape the dough is set in balls and held in the freezer for 24 hours. Additionally, the ice cream freezers hold 120 tubs of ice cream which is refilled 2-3 times a week. The most flavor is chocolate chip cookies for both top and bottom with vanilla ice cream in the middle. Customers who have dairy and/or gluten concerns have the option of soy ice cream and gluten free chocolate chip cookies. We had the opportunity to attend the media opening of The Baked Bear this past Saturday. We were allowed to make our own ice cream sandwich which is far tougher than you might believe. We chose funfetti cookies, birthday cake ice cream, and then rolled it in rainbow sprinkles. We loved our ice cream sandwich! The cookies are baked to perfection (with the option to warm them even) and taste amazing! If ice cream sandwiches aren’t your thing, you can also enjoy a bowl with a cookie, donut, or brownie on the bottom. Their are infinite options to enjoy! The Baked Bear is finally here and definitely worth checking out! That ice cream sandwich looks great! Yum! I feel like literally everyone I know was there this weekend! Even my nephew and his wife. It looks super delish!